Missing in action for over a month, I’m back! . . . . 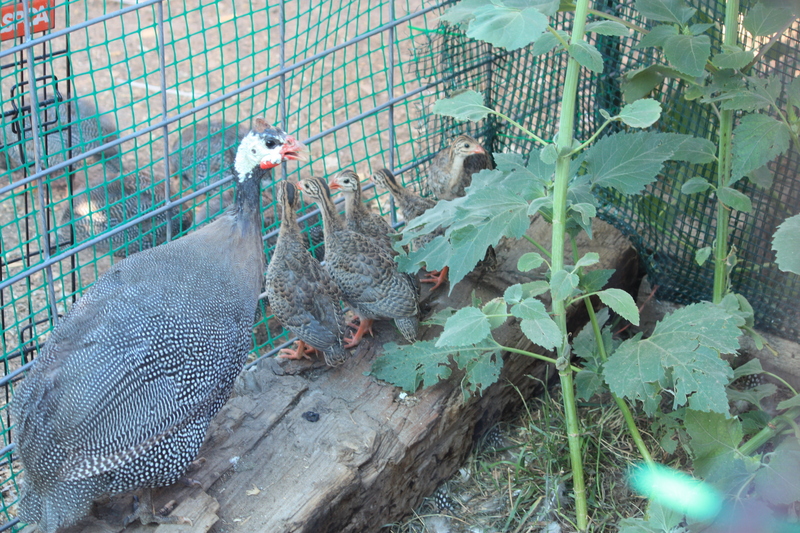 This guinea hen was identified as #10 late in June when she disappeared from sight. Our evening headcount came up short, and a frantic search began for “#10” as she became known. Rosie the guinea hunter almost always finds her girl and we have routed guinea hens from their far-flung nests on numerous occasions. This time was different. We tromped through the sage, peering into old rotting tree stumps and willow groves, and fanned the tall grass to find #10, to no avail. 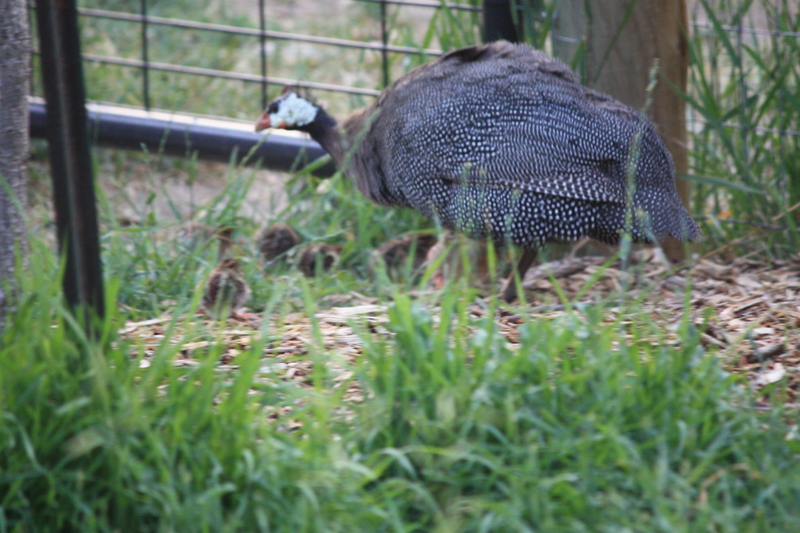 We searched all the outbuildings and sheds, as well as the garden, where our last guinea hen managed to hatch five babies safely on June 9th. After three nights of searching, we gave up and decided #10 had met up with a coyote, bobcat, racoon or heaven knows what else that lurks “out there.” There was no sign of her during the day, sneaking into the coop for food and water, nor did we detect her anywhere at night. Survival outside the coop is unlikely. Rosie’s nose doesn’t fail. Or does it? We tried to comfort ourselves over #10’s loss with the knowledge that five babies were growing and thriving in the goose house we converted into a nursery for the occasion. Our little guinea flock would continue to thrive somehow in spite of all the obstacles! And then one morning early in July, we heard a guinea hen outside our bedroom window, squawking her loudest to get our attention. It was 5:30 a.m. and sleep befuddled brains tried to sort out why a guinea was outside our window when we had locked them all up the night before some distance away. I peered outside and a guinea hen was walking slowly through the grass, stopping now and then to crouch and spread her wings as if to rest. She was heading to the guinea coop and pen east of the back yard, but going at a decidedly slow pace. And then I saw something else flowing along underneath her feathers. Numerous little legs– like orange spokes on a wheel– were carrying her along. It was a very cool, damp morning following a brief shower the night before, and #10 stopped intermittently to warm her babies. Hurry through the gate, we’re almost home! . . . .
Six little tiny guineas, not much bigger than bumble bees, made it all the way from the nest, which had to be down in the creek bottom somewhere north and west of the house, all the way across the back yard, and now under the gate to home base just a few feet more. Only hours old, they have covered approximately 1/2 mile and endured all sorts of challenges that we can only imagine. No sooner did they make their presence known, than we gradually became aware that Rosie had been barking frantically and circling an old giant cottonwood down in the very creek bottom where #10 had recently departed with her brood. Rosie had treed a very large raccoon ( much to the consternation of the raccoon), who likely had planned to raid a guinea nest for eggs for his breakfast. We had no place to put #10 and her keets, as the current nursery had five occupants only three weeks old. We had allowed their mother hen to return to the flock, as she became very stressed being “cooped” up with her brood (hmmmm!) and these five were doing very well on their own in the goose house. As we milled around in hopeless confusion, Neighbor Tom arrived in his golf cart to observe the early-morning pandemonium. After a brief palaver, the men determined that the best course of action would be to dispatch the raccoon (at least that was an easy decision to make, since he was too big to fit into our trap and wasn’t likely to be talked down out of the tree). I was left to sort out what to do with six squirming, darting keets and a stressed-out guinea mom who wanted someplace to go, now! I had just cleaned and re-organized my garden shed after raising four baby geese in it, and while I hated messing things up (and what a mess!) we decided it was our only recourse. The rabbit cage would be too small for #10 and her keets, the sheep trough would be large enough but would not fit in the shed, so it became apparent that #10 and her keets needed the goose house nursery and the five keets-in-residence would have to relocate. Neighbor Tom returned in his pickup with a large wire dog kennel that just barely made it through the door of the garden shed, and after a furious flurry of flying frightened keets, we managed to contain the five and shove the kennel into the shed. All but one. There is always one who refuses to cooperate. He wriggled out between the bars, (I say “he” because only male guineas exhibit such contrary behavior) which seemed impossible, and was darting about the shed, hiding behind rolls of weed barrier, snow fence, barrels of grain, and all the detritis of a garden shed. Life outside the dog kennel would be brutish and short, so I had no alternative but to re-capture the escape artist and stuff him back into the kennel. The garden shed has a sloped roof, and while I can stand on the south side, I have to crouch on the north side where the ceiling drops to somewhere between 3-4 feet. It was constructed circa 1930’s as a poultry brooder house and the design was “depression-era short-on-lumber.” As I rummaged behind flower pots, window screens, bags of fertilizer, et al trying to catch the elusive keet, I lunged for him and caught him by the wing, standing up prematurely and banging my head on the rafter above me. The keet flew out of my fingers and I had to start all over again, in a somewhat dazed state. I went through similar forms of torture three more times before he finally decided he had enough and stayed in the dog kennel where, in a few days, he grew too large to crawl out between the bars. But I digress. Meanwhile, #10 is still awaiting some decision about where to take her hatchlings, and as they scurry and dart about, she is growing more agitated. We cornered her along the garden fence and decided we would grab her, catch the keets, and deposit everybody into the recently vacated goose house. Ha! Catching her was tough enough, but the tiny keets crawled under the garden fence and lodged under an old kitchen sink cupboard. After some heated discussion, we agreed we had to lift the sink carefully to avoid crushing them, then pounce in six different directions to capture them. Neighbor Tom was the fastest with the most catches (5) to my (1) and we tossed them into a red plastic bucket. (I, of course, had an excuse for such a low capture rate, as my experience in the garden shed with the other five left me somewhat incapacitated.) And of course, my husband was left trying to hold the sink! The glory of motherhood . . . .
#10 is a model mother, and after her month-long travail out in the wild tending and protecting her nest, she and her six keets are thriving. We are still slightly amazed that she pulled it off, and have decided that, genetically, #10 is a champ! The five garden shed residents (in the foreground) have just graduated to the adult pen, where they were picked at unmercifully this morning and had to retreat to the dog kennel for protection. We have to watch and pray that they will be accepted and be fleet of foot until it happens. By now,you’re probably wondering why there are only five little keets in the above photo with #10. THERE IS ALWAYS ONE WHO WILL NOT COOPERATE! 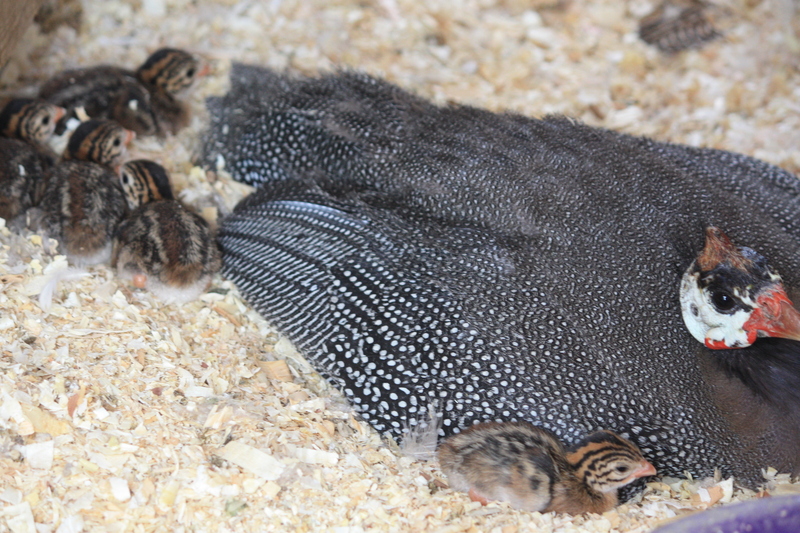 This entry was posted in Wildlife blog and tagged guinea hens by bygeorge. Bookmark the permalink. HaHa! Your best blog yet! glad you enjoyed her story!